Are you in the market for a hosted contact center software solution designed specifically for a large business? If so, you’ve probably come across two well-known virtual call center providers: inContact and Ameyo. Both companies have a strong reputation for providing high quality VoIP services for companies looking for a blended call center solution. Although they are both major players in the call center market, inContact and Ameyo serve different audiences. InContact charges customers per feature and their platform is designed almost exclusively for enterprise-level customers. On the other hand, Ameyo, like most VoIP call center providers, offers smaller packages of bundled features so that small and mid-level businesses have more affordable options if they want to use their service. Since both companies are strong choices for a hosted cloud call center, it may be difficult to decide which solution is right for your business. This post will help describe the type of customer for which each cloud call center providers’ products are designed. All you have to do is ask yourself which type of customer you are. Ameyo offers three separate call center software packages – Starter, Professional, and Enterprise – each of which appeals to different customer needs. InContact is also a flexible platform, but it is really designed for enterprise customers. Potential customers receive a quote based on the individual features they want and the number of seats and special needs they would like. Both Ameyo and inContact offer the features you expect from a virtual call center provider – an advanced IVR, ACD, call recording, manageable call queues, hunt groups, live monitoring, historical reporting, etc. They also offer more advanced functionality, including autodialers. Both companies also include a Service Level Agreement with their services, which means the customer is guaranteed a certain level of uptime beforehand. Ameyo and inContact both have fairly impressive dialers built in to their service. Both dialers can be used for predictive, preview, progressive, auto dialing and parallel predictive functions. Due to regulatory laws regarding the use of automatic dialers, many companies no longer offer them with their platform. InContact addresses this with built-in regulatory measures that relieve the burden of compliance from the customer. On top of that, InContact’s dialer is also able to integrate with many prominent CRMs. Both companies offer an impressive outbound dialer option, though we give the edge to InContact due to their integrations and built in compliance measures. Another important service that sets these companies apart for large-scale customers are their omnichannel capabilities. Omnichannel refers to the ability for a company to maintain a unified marketing message and interactive relationship with customers across many channels of communication. This allows call centers to seamlessly resolve customer support questions over multiple modes of contact, like chat and social media. That way, customers get the answers they need quickly and conveniently. Advanced omnichannel presence is a fairly recent offering for the market, and both Ameyo and inContact have solid early offerings of this feature with their platforms. Like many providers, Ameyo offers different levels of support depending on the package you purchase. With their “Starter” tier you receive access to their online resources and email support. Upgrade to “Professional” and chat support becomes available. It is not until you subscribe to their “Enterprise” tier that phone support becomes available. At first glance, inContact might seem more expensive than Ameyo. But, all of their customers have access to an extensive online resource center as well as 24/7 phone support. In addition, they offer premium support, training and consultation packages that are second to none. These packages may include a dedicated support and performance manager from inContact, additional onboard training for your team, and semi-annual meetings with inContact’s professional consultants. Enterprise managers who want to maximize efficiency and minimize communication headaches will appreciate these offerings. Although inContact does not advertise their pricing online, they make it clear that their platform is designed for large companies with large budgets. This cloud call center provider also does not advertise any prepackaged bundles online. Instead, they allow you to build your solution feature-by-feature. This may be confusing for some smaller customers who have not used VoIP service in the past. But, it is a benefit for the enterprise-level customers that inContact is more likely to attract. 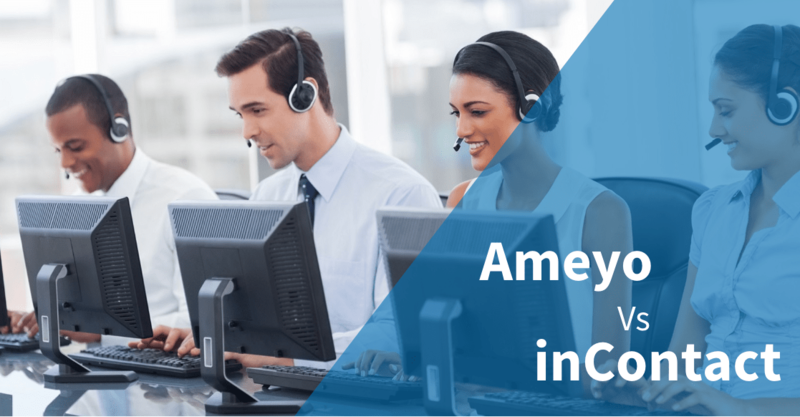 Unlike inContact, Ameyo is transparent about the pricing of its call center software. That said, only the largest of their three tiers, “Enterprise,” is comparable to inContact’s platform. This is because “Enterprise” is the only tier where the customer gets access to phone support, helpdesk capabilities, automated workflows, and full dialer functionality. According to Ameyo’s website, this tier is available for as low as $70 per seat. If you need enterprise-level features but don’t require a large number of seats, this solution is much more affordable than inContact. If you have a large number of agents and are willing to sacrifice some advanced functionality and phone support, then Ameyo’s “Professional” package is likely more affordable for a large company compared to inContact’s service. Which Cloud Call Center Provider Is Right for Your Business? Both Ameyo and inContact are reputable virtual call center providers that offer high quality service for their customers. If you are a small or mid-size operation, one of Ameyo’s three product packages should be able to handle your communication needs at a reasonable price. If you do have many agents but don’t necessarily need the advanced functionality of an enterprise platform, Ameyo may still be the better balance of functionality and cost. Just remember that their service does not include Helpdesk integration or phone support with anything less than the most advanced package. That said, inContact seems to be ahead of the curve when it comes to enterprise-grade solutions. Along with their offerings for premium support, training, and consultations packages, inContact’s large-scale functionality puts them higher on the short list than Ameyo for enterprise customers.